The Jedi order was utterly crushed at the end of the Clone Wars, but the newly risen Emperor knew that future Force users would come to oppose the might of his Galactic Empire. This threat could not be allowed to survive, so the Emperor appointed a fallen Pau’an Jedi to the office of Grand Inquisitor. The Grand Inquisitor’s mission was simple: carry out the will of the Emperor and hunt down any surviving remnants of the Jedi. 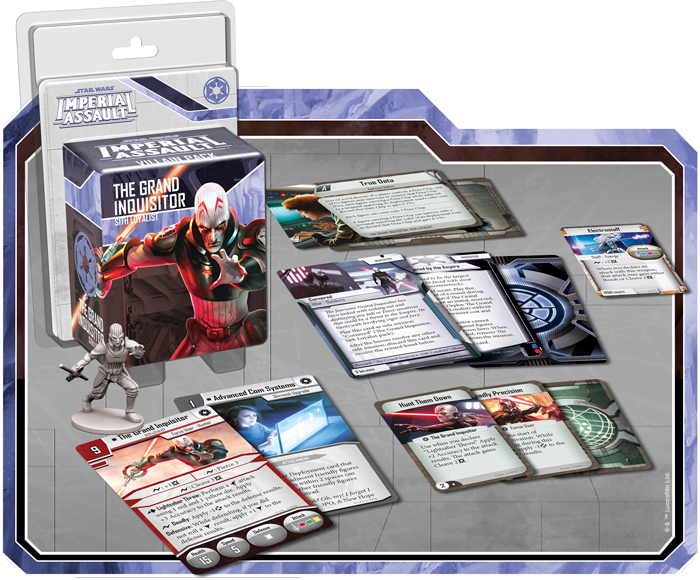 The Grand Inquisitor is a terrifying opponent for the nascent Rebellion to face, and with The Grand Inquisitor Villain Pack, you can bring this dark side Force user into your campaign and skirmish games of Imperial Assault. Like previous Imperial Assault figure packs, this expansion offers a sculpted plastic figure with new cards and missions to supplement your campaigns and skirmishes. Today, we’ll join the dark side and preview the deadly tactics you can expect to find in The Grand Inquisitor Villain Pack. Among the servants of the Emperor, few are more dangerous and better suited to dispatching rogue Jedi than The Grand Inquisitor . Armed with a unique, double-bladed lightsaber and a cunning knowledge of the dark side, The Grand Inquisitor is a terrifying sight for any Rebel strike team to encounter, whether they face him in a campaign or during a skirmish. Even setting aside his more advanced abilities, The Grand Inquisitor is undoubtedly powerful. For just nine points, you gain a figure with fifteen health, five speed, and three attack dice! The Grand Inquisitor also offers plenty of surge abilities, which gives you options for attacking each enemy. Against figures with high health, you can spend your surges to pierce armor or add more damage. When facing a tightly packed group of enemies, you can spend a surge to cleave damage onto an adjacent figure. Or, if you’re battling against an evasive enemy, you can spend a surge on the Deadly ability to cut straight through your opponent’s dodge—negating the primary advantage of the white defense die. The Grand Inquisitor’s other abilities only make him more ferocious in a fight. 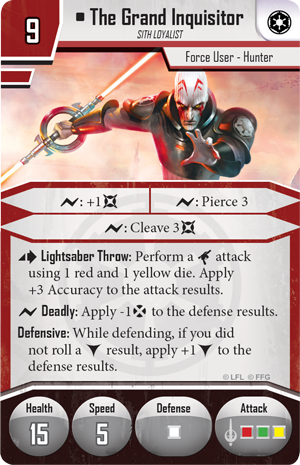 Though he rolls only a single white defense die, The Grand Inquisitor also benefits from the Defensive ability, which grants him a bonus block whenever he doesn’t roll a block. With this ability in your skill set, you can close in on your enemies without worrying about being easily defeated. You may even combine your deadly fighting style with your mastery of the Force when you use Lightsaber Throw. This ability allows you to make a ranged attack with a red and yellow die, potentially destroying figures that your opponent wanted to keep out of your reach. Finally, it’s important to note that you can still trigger Cleave while making a ranged attack with Lightsaber Throw. What’s more, you aren’t limited to a figure adjacent to your target—instead, you can choose any figure within range of your accuracy, making it easy to spread a swath of destruction through enemy figures. The Grand Inquisitor triggers Lightsaber Throw and spends a surge to cleave damage onto another figure within range. Over the course of your Imperial Assault campaign, The Grand Inquisitor can become a recurring villain for the Rebels to face. Though he may not show up in every mission, he’s certain to inspire terror when he does appear, inviting you to relive some of the most thematic moments of Star Wars: Rebels. Few figures offer the sheer damage output of The Grand Inquisitor, so if you’re hoping to win by bloodying the heroes, The Grand Inquisitor is an invaluable asset. 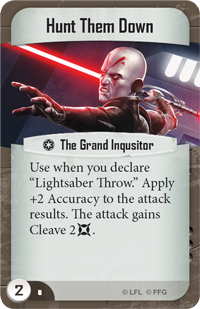 Of course, The Grand Inquisitor also comes with a completely new three-card Agenda set that you can use to support the power of the Inquisitorius across the galaxy. 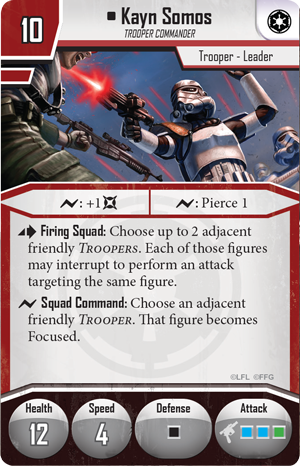 A new campaign Agenda mission challenges the Rebels to escape from a trap that The Grand Inquisitor has set on Ithor, but the other Agenda cards in this set allow you to hunt Rebels across the galaxy. 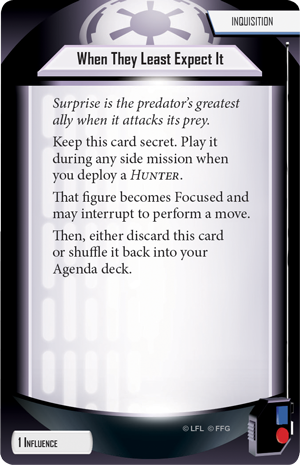 You may play When They Least Expect It when you deploy a Hunter, allowing the chosen figure to become Focused and move, helping you get into perfect position to spring your trap. Alternatively, you may choose a Rebel hero as The Grand Inquisitor’s target with Targeted by the Empire. 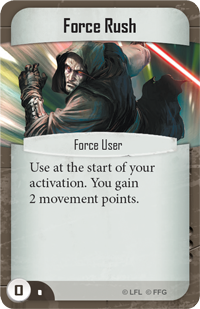 This card allows you to immediately deploy The Grand Inquisitor into play and choose one of the Rebel heroes. The Grand Inquisitor can only attack the chosen hero, and when that hero is defeated, The Grand Inquisitor is removed—his mission successfully completed. If you desperately need to destroy one of the Rebel heroes, The Grand Inquisitor just might give you the edge you need to claim victory in a side mission. If you fear The Grand Inquisitor during a campaign mission, imagine how your opponent must feel to see him joining your strike team in a skirmish game! When you combine his low point cost with the massive amounts of damage he can deal to your enemies, The Grand Inquisitor is a natural fit for any Imperial strike team. If anything, The Grand Inquisitor gives you an extremely versatile figure that can easily serve as the core of your army. 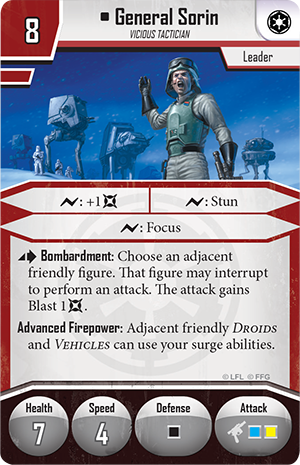 Imperial strike teams can also benefit from the new skirmish upgrade included in this Villain Pack: Advanced Com Systems. This upgrade can be attached to one of your Leaders, and it reads, “Abilities on your Deployment card that choose or affect adjacent friendly figures or friendly figures within 2 spaces can choose or affect other friendly figures within 3 spaces instead.” Essentially, this upgrade expands the reach of your Leader’s orders, giving you greater command over the entire battlefield. Though Advanced Com Systems obviously helps figures like the Imperial Officer, it’s almost certainly better used with figures that only boost adjacent figures, such as General Sorin or Kayn Somos. Both of these Imperial Leaders offer extremely powerful abilities, but they only affect adjacent figures. With Advanced Com Systems, you can spread your commands broader and keep your figures further apart, reducing the chance that you’ll be destroyed by abilities like Blast attacks. 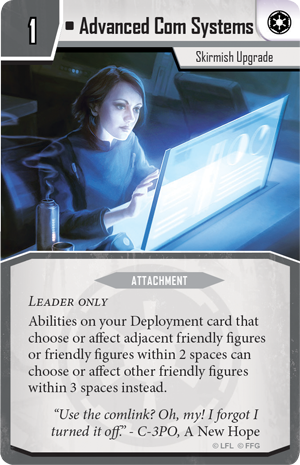 While your Leaders gain the advantage with Advanced Com Systems, you can help the Force Users on your strike team with the three new Command cards included in this figure pack. Force Rush gives a Force User two movement points at the start of his activation, which can give you a small boost to dash into close combat. 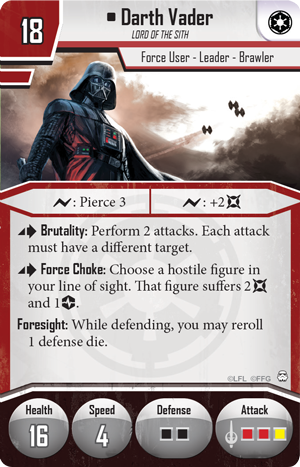 Deadly Precision, on the other hand, subtracts a dodge from all defense results during your activation—making it a perfect card for villains like Darth Vader who can make multiple attacks at once. Finally, you may make The Grand Inquisitor an even greater threat with Hunt Them Down, his personal Command card. 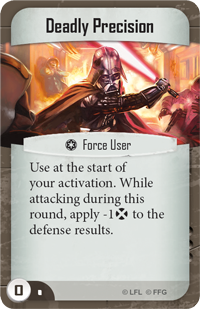 This card can be played after you declare Lightsaber Throw, and it not only boosts your accuracy, it automatically lets you cleave two damage! If you spend a surge to add more cleave damage, you could easily cut down two figures with a single, masterful throw. The Grand Inquisitor is on your trail—and you cannot escape. Wield the power of the dark side with The Grand Inquisitor Villain Pack for Imperial Assault, and stay tuned for our next preview, where we turn to the Greedo Villain Pack! 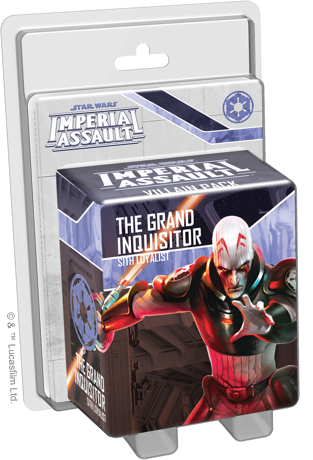 Pre-order your copy of The Grand Inquisitor Villain Pack at your local retailer today.